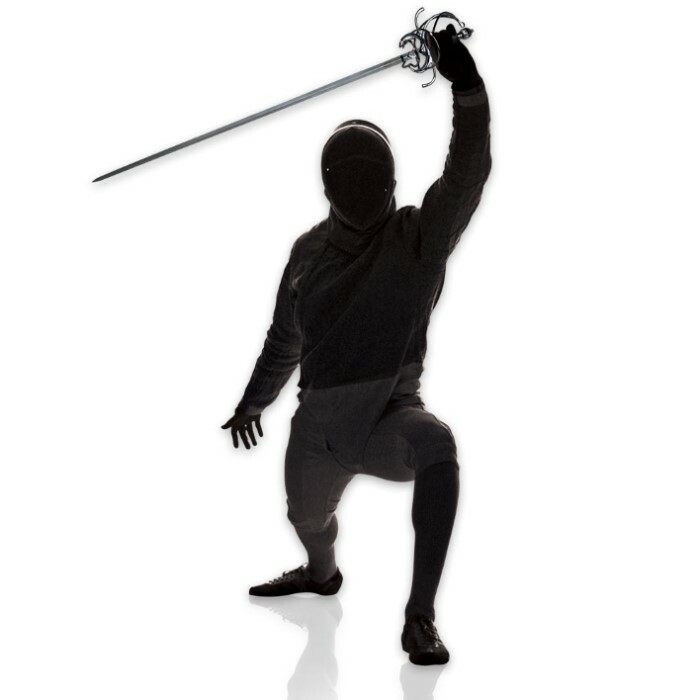 Only True Swords can offer top quality rapiers at such an unbeatable price. 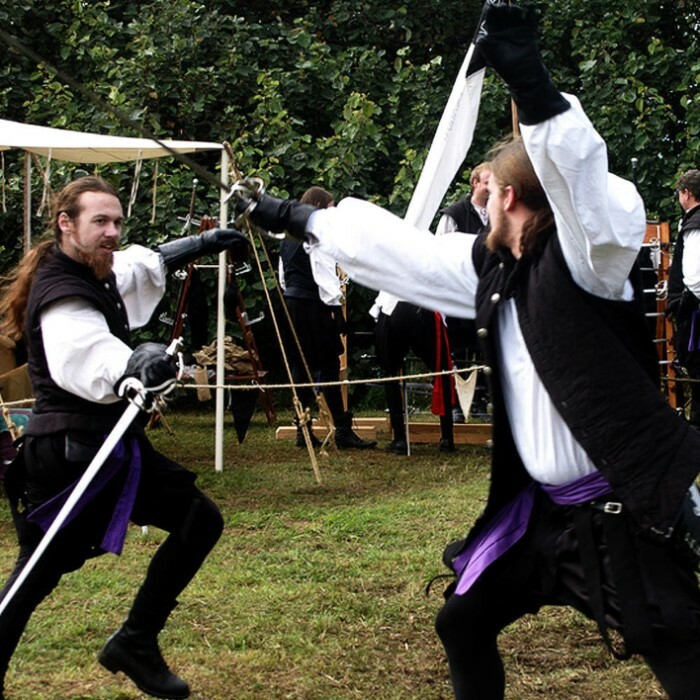 These classic favorites trace their origins to early 17th Century Europe where sword play with the rapier was considered an essential part of a gentleman's education as well as resolving gentlemanly disputes. mirror finish. The wire wrapped grip is Equipped with a 36 1/2" stainless steel blade with a surrounded by twisted steel creating an authentic appeal to each collectible. Includes leather sheath. 44" overall. For the cost, it’s cool to have. Ya the scabbard is crappy. The blade is flimsy. But holding it in your hand feels really very cool! The engraving is a very nice touch! A Princess Bride type sword! I really liked the look of the sword as the wire-basket hilt and rapier style matched my intended persona of a Musketeer, but I was somewhat worried about the negative reviews I had seen. I did note that none of the negative reviews were too recent so I took the plunge and ordered one with my name engraved on the blade. I was very pleased with it when it came in. No defects at all - tight, straight blade, wire-wrapping on handle, and leather scabbard were all in pristine condition as expected. The free knife that was thrown in was nice too - I'll definitely return here for any of my replica weapon needs. When I first received this sword I was not impressed. The quality was poor and it looked like no thought was put into it. My first problem with it was the handle, the wire wrap felt like it was barbed wired and the guard rattled and felt like it would disconect anytime. The guard felt like it was spray painted and looked just awful. Then there was the problem with the blade, the blade was off center when connecting to the handle which made it very crooked and the center of the blade was bent and the blade clearly showed it leaving a black bend mark. The scaberd was all twisted and the metal easily slipped off, it almost looked like it was done by less than a novice. All in all, it was a very disappointing buy. The sword is good, but that scabbard is so tight, you have to pull very hard to get the sword out. Can you guys make hand forged replicas of the rapiers from princess bride please I'm looking for one to get my sister since I'm teaching her all the lessons I took back when I was a fencer. Plus it's her favorite movie. This is a really beautiful sword. I presented this sword to my best friend at his wedding. I had his military service engraved on this sword with the US Army medalian attached to the sheath. 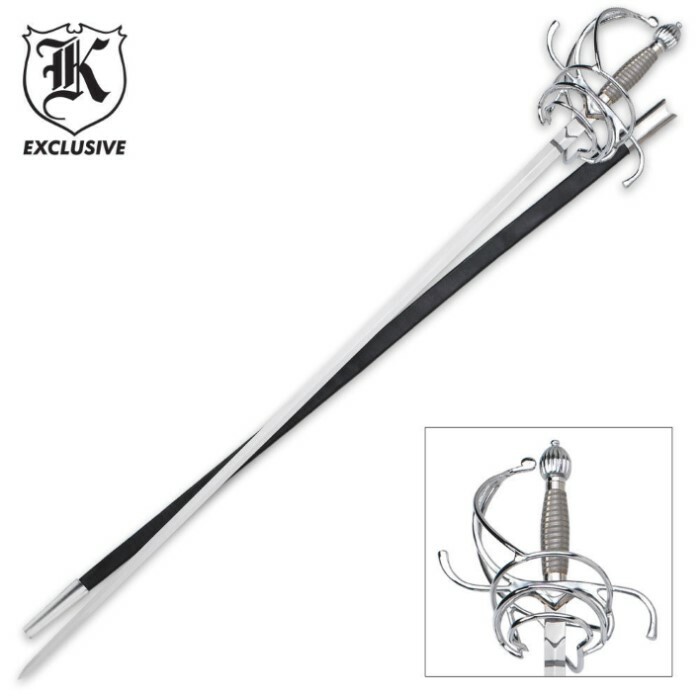 So this made an incredible gift and I would recommend this sword to anyone whose looking for something elegant and beautiful. I have waited three years for my rapier and finally after I have one and going to get one to match it. it balance is good the weight is heavier than I thought it would be and that makes it really good . I can spare with a friend after getting the matching one. The fame of the Rapier Sword ... well the name speaks for itself. I would recommend the Rapier to collectors and others who would like a piece of history and for the fun of learning how to use a real sword . Thanks BUDK .